Posted by Tim Cronin on May 2, 2017, 2:15 PM. Filed in Company News. Comments are closed. Businesses want to protect their welders, so making the right choice is a critical task that has implications for worker health and safety, insurance, and regulatory compliance. 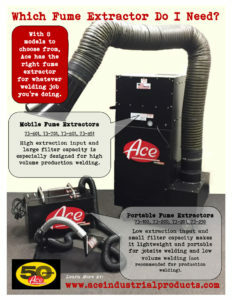 Furthermore, a fume extractor is an investment, and like all investments, the financial outlay for the equipment must yield appropriate results. That’s just prudent business. It’s a simple question, but it gets to the heart of the matter. Once that question is answered, the rest is simply matters of personal choice, physical space, and budget. We will talk more about those three qualifiers in Part 2.